The Upper Manistee River starts near Mancelona. It runs parallel to the Au Sable River for about 12 miles before they split up and go their own directions. The Manistee winds for nearly 80 miles before flowing into Lake Michigan, while the Au Sable ends up in Lake Huron. The best fly fishing on the Upper Manistee is near Mancelona and continues for over 30 miles to the M66 Bridge. The river starts out narrow, less than 25' wide and very easy to wade, and ends up over 100' wide near the M66 Bridge, which is a little more difficult to wade. Pay attention to the area between M72 and the CCC Bridge as it has special regulations. This is a great stretch of water and you should take a shot at the fish in this section since this is where some of the bigger fish hold. 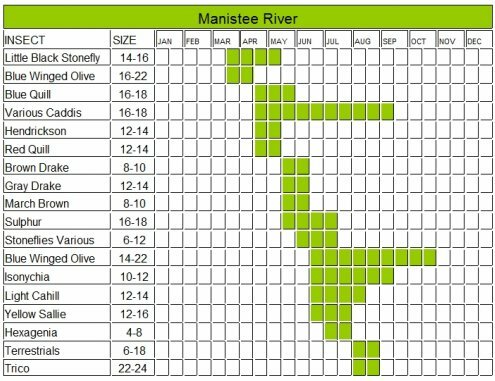 Upper Manistee has a nice variety of trout throughout the river. The Brook Trout tend to populate the beginning of the river. Rainbows and Browns populate the lower stretches of the stream. The fly fishing is open year round in the fly’s only area. Below Tippy Dam and to Lake Michigan is where you will find the Steelhead. This section of the river has to be fished from a boat because it gets faster, wider and deeper. This river is mostly known for its Salmon and Steelhead runs. The number and size of these fish is amazing and it brings people here each year. There is great streamer fishing early in the season. May brings with it some nice hatches of Blue Winged Olives, Stoneflies, Caddis and Sulphurs. The fish are usually ready for these treats after a long winter. June is probably the best month, especially with the Hex hatch that starts mid month. There is great fishing through the summer into fall with fish hitting on the usual terrestrials. 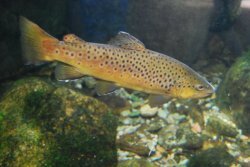 The Brown Trout will take anything from a crayfish pattern to a mouse pattern if you put it in front of them. The river is set up nicely for both the wader and the floater so it is up to you. Map of the Manistee stream area. Leave the Upper Manistee River and return to the Michigan River.